Sweet Sadie's Baking: Sadie's Rugelach Filled with Lumps of Delight! Sadie's Rugelach Filled with Lumps of Delight! 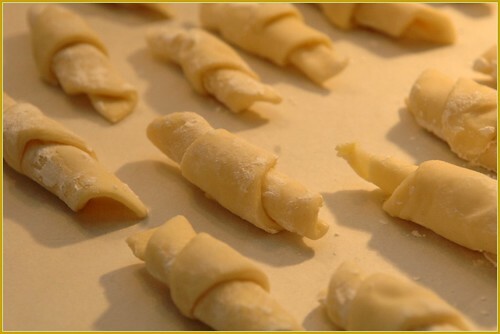 I found the recipe on a scrap of paper and I don't know what they are called but I would say that they are Rugelachs, because they are rolled like them. I made them and filled in some of the missing details...maybe Elliot will add some when he reads this. After all, this recipe was a favorite of his and he did have a private lesson. They are quite simple to make, so don't hesitate to try them. Mix butter, cream cheese, and flour in food processor just until mixed and gathers together. Do not overmix. Divide into 8 balls and wrap individually in plastic. Place in the refridgerator overnight. Roll each ball into a circle on area dusted with powdered sugar (not flour). Using a pizza cutter, if you have one, divide each circle into 8. 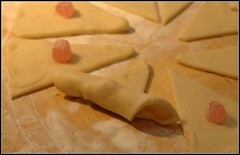 Place a very small piece of Turkish delight in the center and roll from the wide end towards the point. Place cookies on a parchment lined cookie sheet. I needed 2 cookie sheets for this recipe- 32 cookies on each sheet. Bake for approximately 20 minutes. Keep checking them as they burn very easily and remove from oven when slightly golden. Cool completely, then roll in powdered sugar. By the way, Dan liked them too! 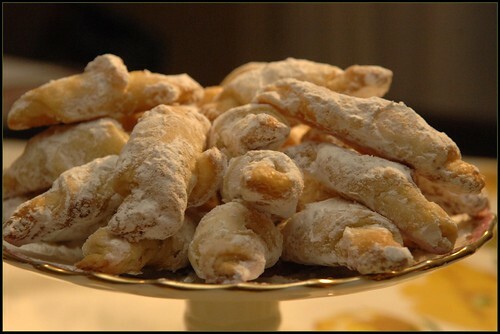 I like snacking on Turkish delights :) Thanks for sharing a family recipe! There is a little store in the St. Lawrence Market in Toronto that sells it. He is very proud that he makes it fresh! It is soooo soft and lovely. Save some for me and Brenda !!! These look good! Can't wait to give them a try at home! Thanks for sharing! Pat..you and Brenda are always welcome to stop by and sample! Let me know how you make out Dot! Nice recipe and pics! 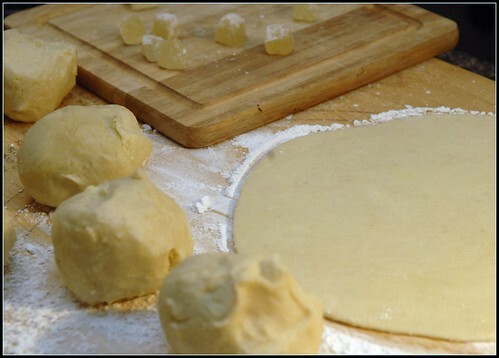 I love rugelach and now I can make it at home. Thanks! I would like to invite you to share your recipes and cooking tips with us at Foodista.com. It's a cooking encyclopedia that everyone can edit, full of recipes, food blogs, cooking techniques and more from around the world! We also have small embeddable widgets that can help you build traffic from Foodista-related pages - Check it out here. Thanks!